New Year's Eve seems hardly the time to explore a new recipe. Especially when you've offered to host a potluck dinner party for 10 at the last minute. And...when you actually start the recipe about 30 minutes before your guests arrive. Yet I simply had to try this recipe. I've also been obsessed with finding a non-cow's milk cheesecake option for months. Cheesecake is L's favorite desert, even though he is lactose-intolerant (with the exception of goat cheese), and frequently he will choose to indulge anyway, suffering the consequences. I've been determined to find another option. For his birthday this past year, I made him a tofu cheesecake. It wasn't amazing. It seems that when you look up "lactose free" you automatically get vegan recipes. That's why I was so excited when I first encountered goat cheese cheesecake at my friend's new restaurant in DC, Beuchert's Saloon. It was fantastic. You should absolutely go there if you have the chance. I found the goat cheese cheesecake recipe I made through random Google searching on frijolita. Check out her original recipe. She seems to have a lot of cool recipes. Her cooking photos are also beautiful. So my visions of mini cheesecakes went out the window temporarily. Being that I made this cooking decision hours before my guests arrived, I bought a pre-made graham cracker crust. Some day I will be brave enough to try that part on my own. I set out to start trying to follow the directions for the filling. This recipe is fairly simple in terms of ingredients: goat cheese, sugar, lemon juice, lemon zest, vanilla, eggs and flour. It seems healthier than most cheesecakes - at least to me. Am I right?? First, I combined the goat cheese with sugar. It said to use granulated sugar, but all I had was this raw turbinando sugar from my adventures in vegan baking for my co-workers. Eh, same same. Next, I added in all the vanilla I had. The recipe dictates a teaspoon of vanilla, yet I only had about a half a teaspoon left in my makeshift pantry. In it went. This cheesecake is very lemony. I squeezed half a lemon and added the juice, and then added lemon zest. My mom got me this zester and I love it! I also use it for grating cheese. Tiny kitchens call for multi-use gadgets. And then beat the egg whites....they were supposed to be firm, but not stiff. What does that mean? I also realized that I had more than enough filling - enough to make mini-cheesecakes as well! Although the mini-cheesecakes were missing little graham cracker crusts, they turned out just fine. If only this recipe didn't have flour in it, it would be a great gluten-free option. Here is my final product. I tried to peel a lemon peel all curly like the pretty picture on the cooking blog, but it didn't look quite the same. Both the mini cheesecakes and the big cheesecake only took about 25 minutes due to my extremely temperamental, hot oven (the recipe said 50 minutes). They both tasted great! 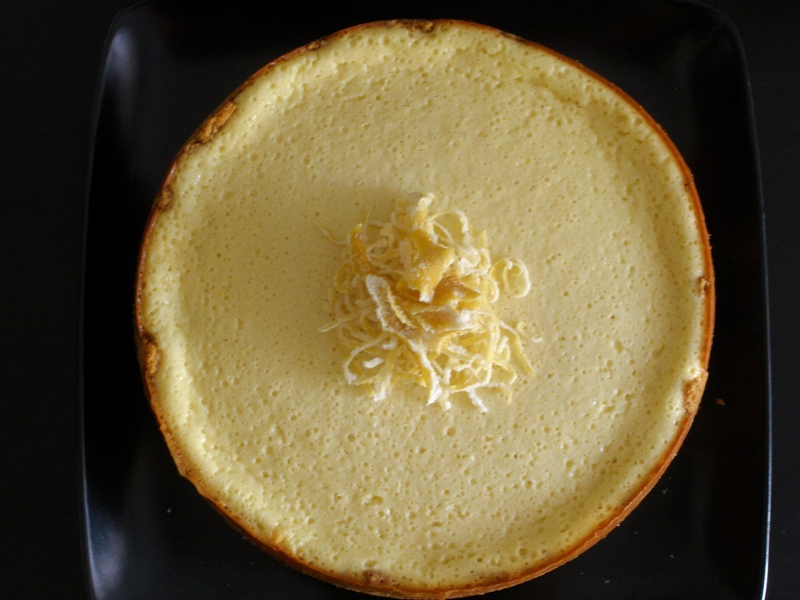 The cheesecake texture was light, fluffy, and lemony. It did, however have some stiff competition from the cookies and cream mini cupcakes my friend contributed to the meal. Eh, more for me. Happy New Year!